Yannis Philippakis: "I felt like not to engage with it at all would be artistically dishonest"
"This is the first time, really, where from inception to endpoint — all the way through — it's been us without any kind of interference," says Yannis Philippakis, lead vocalist/guitarist of Foals, regarding the band's forthcoming double album, Everything Not Saved Will Be Lost. Philippakis doesn't consider working with outside producers to be a "bad thing," he tells Exclaim! in an interview, but self-producing "meant that it was a much more secluded process, and there wasn't really any communication to the outside world at all for, like, over a year." This isolated process led to the recording of a body of work that's been split into two parts, with the release of Part 1 on March 8 and Part 2's arrival later this autumn. Known for their ferocious live shows, Foals traversed the globe in support of 2015's What Went Down, a record made off the back of the campaign behind 2013's Holy Fire. 2017 found the band purposely stepping away from music to reconnect with their lives outside of touring before regrouping to bounce between their writing room and 123 Studios in their South London neighbourhood. "I think it was really important for us to kind of make our worlds quite small again and just lose ourselves in small, domestic rhythms, and have time to kind of recharge and build up energy — and build up boredom as well in a way, so that when we went to make the record that it was kind of an explosion of creativity," explains Philippakis. 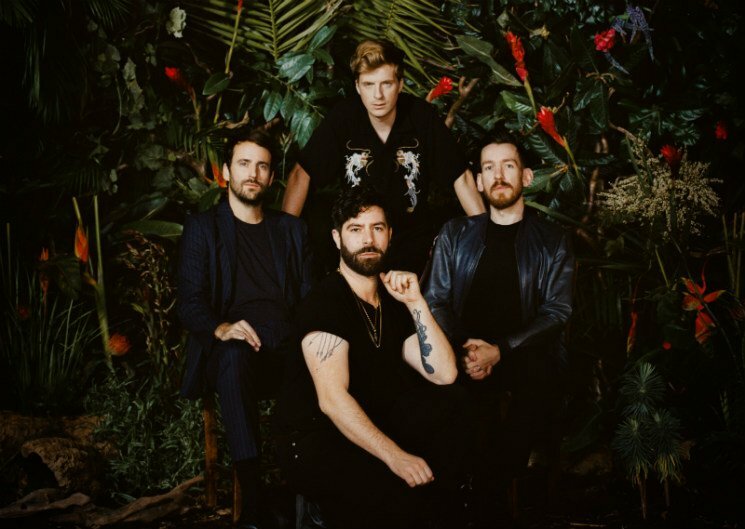 Last year, Foals experienced what he refers to as their "first bump in the road" when founding member and bassist, Walter Gervers, left the group after 12 years. This loss caused the remaining members to form a tighter unit. "[Walter's departure] reinforced our commitment to each other," asserts Philippakis. "[It's] probably a psychological mechanism to be like, 'We're all in this together.'" As such, Everything Not Saved Will Be Lost – Part 1 feels like a subtle turn away from Philippakis's more inward musings on past records in favour of a more outward look at a world that baffles and horrifies in equal measure. The album feels like both a culmination of Foals' sound so far and a foray into the unknown, mixing atmospheric elements with groove and riff-heavy sonics. Lyrically, Philippakis varies between direct and abstract references to subjects such as losing the ability to communicate with each other, environmental degradation and political conflict. One of the record's closing tracks, "Sunday," is a markedly slower, orchestrated affair in comparison to the band's previous work, echoing the Verve's "Bittersweet Symphony" as it confronts the current climate crisis. Philippakis says the lyrical subject matter stems from an interest in the duality of the human race. "There's a strange ambivalence about what it means to be a human being, where in many ways, we're the most spectacular, incredible creatures. Yet, we are responsible for the destruction of our own futures and of future generations, and of other species that could use a bit of compassion and would benefit from us using our power in a wiser way. I think that we're more culpable than the prior generations. The previous generation, who set up a lot of the structures that are now so well implemented that they're hard to break free from; they never conceived of the ramifications of what they were doing. We are the ones who can see just beyond the horizon — in some cases, just beyond our lifetime is a kind of zero hour — and yet in our day to day lives we find it very difficult to reconcile those two truths." The insistent rock of "White Onions" and slower bloom of "Exits" both engage with similar imagery. "I found, like, not even consciously, but often in the lyrics, I would be talking about labyrinths and mazes," explains Philippakis. "Visually, my mind was [thinking of] M.C. Escher's staircases [with] no rhyme or reason. I just feel like they're very apt visual symbols for the predicaments that we find ourselves in. "We're basically told, increasingly both by advertising and through social media, that we're the kings of our own castle, we're the stars of our own movie. It's all about us, and that we deserve, and demand, and are entitled to a life of unending individual happiness. And the problem is that the problems that we need to solve are ones where simple, individual, monadic kind of actions [do] not work." Philippakis is coy about the forthcoming Part 2, yet gives a hint as to its sonic leanings, which tend more towards the boundless energy with which the band's concertgoers will be familiar: "Record two starts with a bang. It's kind of flipped." He stresses that he "[doesn't] really want to make the process of listening to the records laborious. "I don't want it to feel like some sort of lecture, or like it's a seminar, you know what I mean? I want it to be nourishing and invigorating, and a place of refuge. The records I love are ones where I'm drawn to putting them on because they make me feel good, fundamentally, even if lyrically there's something else going in the headspace." At the end of the day, Philippakis feels glad that he was able to "voice some of [his] frustration" regarding the state of the world through the songs on Everything Not Saved Will Be Lost without proselytizing. "I felt like not to engage with it at all would be artistically dishonest." Everything Not Saved Will Be Lost – Part 1 comes out March 8 courtesy of Transgressive Records/Warner.